With Mother's Day weekend upon us, I wanted to share a gift guide featuring Cappelli Straworld bags. I recently received one and I must say it will make the best Mother's Day gift. So mom if you are reading today's post I got you flowers and a Cappelli bag! I got my fashion sense from my mom so she will love this bag just as much as I do. My shoe obsession though, I got from my dad. LOL! I've always said Mother's Day is every day but if you are gifting your mom something this Sunday a Cappelli Straworld bag would be perfect. They have a large selection of bags with various different sizes and styles that can be found in different retailers. 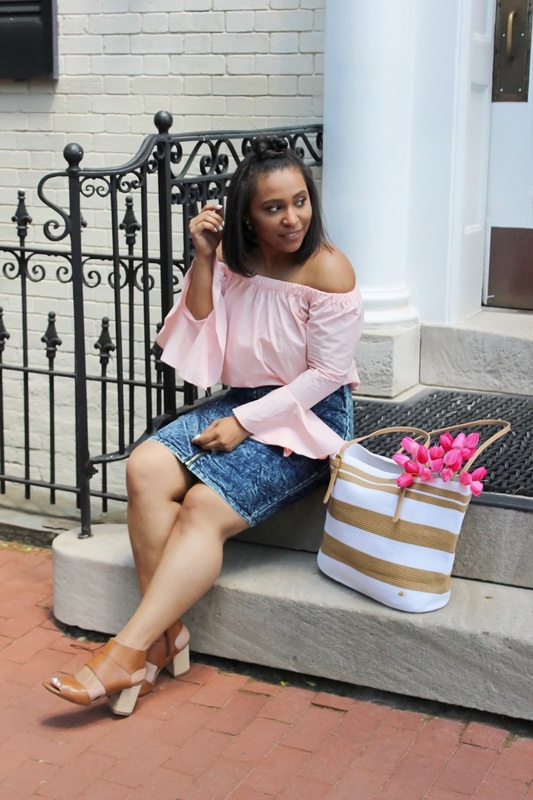 The one I'm wearing in today's look is from their summer 2017 collection, the Striped Straw Tote in white a neutral. I love a big bag where I can fit my life in for those days you need to carry a million things. It can also double up as a beach bag if you wanted to because it's so spacious. What are your Mother's Day plans? I'm lucky enough that I have two moms to celebrate because I was raised by my grandmother. She's essentially my second mom. I won't be traveling to NY this weekend to see them but I will be up in two weeks. That's always been that hardest thing since moving away from NY is not seeing my parents as often as I use to. The good thing is we are not millions of miles away and it's easy to commute back and forth once in a while. I want to wish all the moms, step-moms, foster moms, and fur moms a happy happy Mother's Day! Thank you for being the super moms of the world. See more from this retailer and this one. Cappelli Straworld bag was provided in exchange for a review, as always all opinions stated are my own. Thank you for supporting the brands that work with Patty's Kloset. Good post dedicated to Mother's Day and very pretty and practical the bag that you will give your mother. My mother is unfortunately many miles from me, but whenever I can I cross the Atlantic Ocean to visit her. Gracias Alicia! Te van a encantar las calteras de Cappelli! Besos y feliz dia de las madres! Wow Patty, love the bag, and course how you styled. I'm sure that you will be celebrating with your two moms very soon. Mums always need big bags! I swear my mums bag goes on forever and ever!